“There has been a steadily improving picture in the central London market in recent months with buyers growing in number and deals beginning to shift upwards. 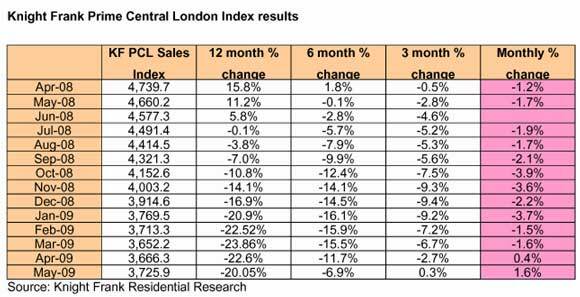 “There is no question that purely in terms of sales activity the central London market is unrecognisable from where it was six months ago. The falls in capital values, cheap debt, overseas investors with US$ and Euros have encouraged buyers back into the market, with many just keen to get on with their lives having put all financial decisions on hold for the duration of 2009. “The release of this pent up demand has meant that for many of the central London offices sales volumes are up significantly with May being one of the busiest months in the last 18 months with volumes over 30% up on the same month last year. We have even see some bankers back in the market after a noticeable absence. “The majority of the sales are in the £1m to £3m price range, two bedroom flats to medium sized family houses with buyers seeking quality – on the best streets, upper floor flats rather than basements and so on. “Even the top end of the market (£10m+) is beginning to get busier with Russians that have managed to retain their wealth buying in the best locations as they are keen to place their cash in the UK.